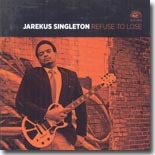 Mississippi guitarist Jarekus Singleton made the switch from basketball to the Blues a few years ago. His new CD on Alligator, Refuse To Lose, is the Blues equivalent of a game-winning shot. It's this month's Pick Hit. Mississippi duo Duncan Street actually got its start on a park bench in Clarksdale. Don't miss their new CD, Baptized By The Blues, our Surprise pick for the month. Legendary bluesman Sleepy John Estes, along with longtime partner Hammie Nixon, made several trips to Japan in the mid '70s, and the result is this new Delmark release, Live in Japan with Hammie Nixon, this month's Flashback feature. Our What's New section features reviews of new CDs from George Bowman, John Mayall, Albert Castiglia, Giles Corey's Stoned Soul, Mikey Junior, Terry Hanck, Bob Corritore, Tomas Doncker, Al Basile, Asylum Street Spankers, and more, plus a new subscription service from Digital White Label featuring the music of Alvin Lee.